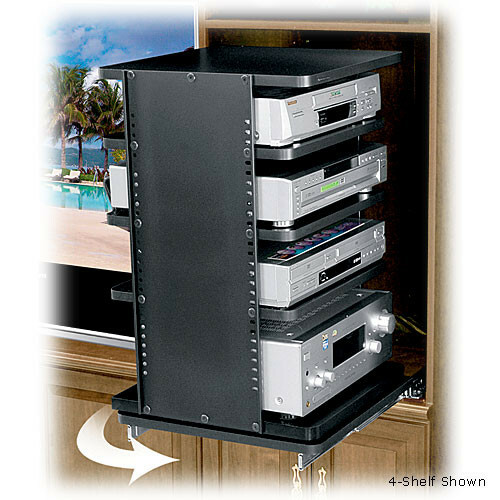 The ASR-42 Slide-Out & Rotating Shelving System from Middle Atlantic is a slide-out and rotating shelving system designed for use with home-entertainment applications. Gain full access to all of your equipment without removing it from the rack by using this unique and practical system. Once pulled out, the rack can be rotated 60° in either direction. This system is ideal for entertainment systems housed in custom cabinetry and millwork, among other similar setups. The unit includes a lacer bar to facilitate the organization of cabling in your setup. A standard locking trim panel also provides an additional level of security for your valuable equipment. The unit is delivered knocked down to simplify shipping. This model is 42" high and includes (6) easy index self-leveling shelves. It will support up to 250 lbs of equipment. This slide-out and rotating shelving system allows you to gain full access to all of your equipment without removing it from the rack. This system is ideal for entertainment systems housed in custom cabinetry and millwork, among other similar setups. This unit will support up to 150 lbs of equipment. A standard locking trim panel also provides an additional level of security for your valuable equipment. The unit is delivered knocked down to simplify shipping. Box Dimensions (LxWxH) 53.0 x 21.0 x 7.0"
ASR-42 Slide-Out & Rotating Shelving System is rated 5.0 out of 5 by 2. Rated 5 out of 5 by Knottjt from Perfect for my application I have installed the 42 slide out system in a custom audio cabinet. The custom cabinet was becoming difficult to make equipment changes as technology changed. The product is very sturdy and was easy to install with instructions provided. It also fits perfectly into my space. It is highly recommended to secure all wiring at the rear with the lacing rods provided. The product fits tightly into the space and It is almost impossible to reach the rear once equipment is installed. Also, spacing of the equipment in rack was also tricky with the provided instructions. Finally, there are no provided solutions to attaching wiring to the rear of shelving, which is necessary. All told, highly effective product. Rated 5 out of 5 by Anonymous from Asr 42 hd I recently purchased this unit because all my equiptment was in a closet and very difficult to access the back of if I ever needed to do any maintenance. This unit allows me the ability to maintain my equiptment as well as makes it very easy and convent to add or remove anything while making the front look very neat and professional, it also allowed me to clean up all my cords and cables in the location. I could not be more pleased with this purchase and am very happy to have spent the money to make life easier down the road.